Background: Patients with chronic obstructive pulmonary disease (COPD) often present with severe acute exacerbations requiring hospital treatment. However, little is known about the prognostic consequences of these exacerbations. A study was undertaken to investigate whether severe acute exacerbations of COPD exert a direct effect on mortality. Methods: Multivariate techniques were used to analyse the prognostic influence of acute exacerbations of COPD treated in hospital (visits to the emergency service and admissions), patient age, smoking, body mass index, co-morbidity, long term oxygen therapy, forced spirometric parameters, and arterial blood gas tensions in a prospective cohort of 304 men with COPD followed up for 5 years. The mean (SD) age of the patients was 71 (9) years and forced expiratory volume in 1 second was 46 (17)%. Results: Only older age (hazard ratio (HR) 5.28, 95% CI 1.75 to 15.93), arterial carbon dioxide tension (HR 1.07, 95% CI 1.02 to 1.12), and acute exacerbations of COPD were found to be independent indicators of a poor prognosis. The patients with the greatest mortality risk were those with three or more acute COPD exacerbations (HR 4.13, 95% CI 1.80 to 9.41). Conclusions: This study shows for the first time that severe acute exacerbations of COPD have an independent negative impact on patient prognosis. Mortality increases with the frequency of severe exacerbations, particularly if these require admission to hospital. Different authors have investigated the predictive factors associated with increased COPD mortality. Forced expiratory volume in one second (FEV1),3,4 patient age,4 hypoxaemia,5 hypercapnia,3 co-morbidity,3,4,6 pulmonary hypertension,7 and body mass index (BMI)8 are some of the adverse prognostic variables most commonly cited in the literature. In recent years other risk factors have also been described including dyspnoea,9 health related quality of life (HRQoL),10 and exercise tolerance.11 A new multifactorial prognostic classification—the BODE (BMI, airflow obstruction, dyspnoea, exercise performance) index—has recently been proposed. This classification, proposed by Celli et al,12 stresses the multicomponent nature of COPD and addresses not only its pulmonary consequences but also the systemic manifestations of the disease. None of these studies has specifically examined the prognostic influence of acute exacerbations of COPD, despite the fact that they have a very relevant role in the natural course of the disease. It has been estimated that COPD patients suffer 1–4 exacerbations per year.13 Such decompensation episodes have an important impact on HRQoL14 and generate great healthcare burdens and economic costs. Between 1% and 2% of all emergency service visits and 10% of all medical admissions are attributable to acute exacerbations of COPD.15 Nearly 60% of the global cost of the disease is associated with exacerbation episodes, particularly severe acute exacerbations requiring admission to hospital.16 Despite this strong impact, however, very few series have examined the specific influence of acute exacerbations of COPD on patient mortality. Some authors17–20 have recently detected a high mortality rate following hospital admission, ranging from 22–43% after 1 year to 36–49% after 2 years, depending on the severity of the COPD patients studied. These series have specifically investigated the risk factors associated with mortality after hospitalisation. Again, advanced patient age,17,19,20 Paco2,19 Pao2/Fio2,17 BMI,17 serum albumin,17 co-morbidity,18,20 cor pulmonale,17,20 and functional status17,18 have been identified as prognostic variables. These results suggest that the principal determinant of death following hospitalisation is the baseline severity of the disease—that is, the greater the severity of COPD, the greater the likeliness of hospital admission and also of death. However, to date no study has examined the possibility that acute exacerbations of COPD may intrinsically exert a negative effect upon patient prognosis independently of the baseline severity of the disease. This study investigates whether severe acute exacerbations of COPD—that is, exacerbation episodes requiring hospital management—exert a direct and independent effect on the survival of patients with COPD. A prospective study was performed in a cohort of 304 male patients with stable COPD. The patients were recruited in the course of 1998 and followed for 5 years. The general characteristics of the cohort and the selection criteria used are described in detail elsewhere.15 Briefly, the diagnosis of COPD was based on current or past smoking history (>20 pack years), clinical evaluation, and pulmonary function testing showing airflow obstruction (FEV1/FVC <70) with a change in FEV1 of less than 200 ml and 12% in the bronchodilator test.21 The severity of the disease was established according to the latest GOLD criteria.22 Patients previously diagnosed with bronchial asthma, bronchiectasis, cystic fibrosis, upper airways obstruction, or bronchiolitis related to systemic pathology were excluded. All included patients were required to be in a stable phase of the disease, without acute exacerbations of COPD in the month preceding the study. A severe acute exacerbation of COPD was defined as any sustained increase in respiratory symptomatology compared with the baseline situation requiring modification of regular medication and hospital treatment.26 A prospective registry was made of all exacerbation episodes requiring hospital management during the year of the study. The patients were divided into three groups according to the number of acute exacerbations recorded: group A (no acute exacerbations); group B (1–2 acute exacerbations); and group C (⩾3 acute exacerbations). Descriptive statistics were used to describe the study population at baseline. The comparison of means among the three study groups was based on analysis of variance, with χ2 testing and Bonferroni correction for comparison of the proportions. Survival of all subjects was assessed after 5 years and all-cause mortality was evaluated. The starting date was taken as 1 January 1998 and the termination date was 31 December 2002. We first conducted univariate analyses based on the Cox proportional hazards model using each of the potential predictors of respiratory mortality as independent variables and survival as the dependent variable.27 Survival curves for the three groups were estimated by the Kaplan-Meier product limit method and compared using the log rank test.28 Independent variables associated with respiratory mortality with p<0.15 in the univariate analysis were then incorporated into a multivariate analysis also based on the Cox proportional model. An interaction term between the variables and time was introduced into the model to analyse risk proportionality. All statistical analyses were carried out using a statistical software package (SPSS for Windows, version 11.5; SPSS Inc, Chicago, IL, USA). A p value of <0.05 was considered significant. Of the 320 cases in the initial cohort, two (0.6%) were excluded because of an absence of smoking history and 11 (3.4%) were excluded because they had a smoking history of <20 pack years. The only women in the study (n = 3, 0.9%) were also excluded to increase homogeneity. The study therefore comprised a total of 304 male patients diagnosed with COPD (mean age 71 (9) years). The baseline characteristics of the patients are shown in table 1. One hundred and sixty three cases (53.6%) had suffered no acute exacerbations (group A); 105 (34.5%) had two or less acute exacerbations, 60 of whom had been admitted to hospital (group B); and 36 (11.8%) had suffered three or more exacerbations, 29 having been admitted to hospital at least once during the year of the study (group C). In general terms, the patients belonging to group C were older and had more advanced disease, with lower FEV1, FVC, and Pao2 and higher Paco2 (table 1). A total of 116 deaths (38.2%) were recorded; 78 (25.7%) were due to respiratory causes and 38 (12.5%) died of different causes (12 (3.9%) from cardiovascular disease, seven (2.3%) from cerebrovascular disease, 11 (3.6%) neoplasms, and six (2.0%) from other diseases). In two cases (0.7%) the cause of death was unknown. Thirty two patients were lost in the course of the 5 year follow up period (follow up rate 89.5%). Table 2 shows the influence on the prognosis of the variables included in the univariate analysis. Figure 1 shows the survival curves according to the frequency of acute exacerbations of COPD. Patients with frequent exacerbations (group C) had the highest mortality rate (p<0.001) with a risk of death 4.30 times greater (95% CI 2.62 to 7.02) than for patients requiring no hospital management (group A). Patients in group B also showed significant differences in survival compared with group A (hazard ratio (HR) 2.20, 95% CI 1.45 to 3.33). Kaplan-Meier survival curves by frequency of exacerbations in patients with COPD: group A, patients with no acute exacerbations of COPD; group B, patients with 1–2 acute exacerbations of COPD requiring hospital management; group C, patients with ⩾3 acute exacerbations of COPD. Eighty nine patients (29.3%) were admitted to hospital at least once during 1998. Mortality in this group after 12, 24, 36, 48, and 60 months was 11.6%, 25.9%, 40.2%, 46.6% and 55.2%, respectively. Patients with only one hospital admission had poorer survival than those with no acute exacerbations of COPD (HR 2.94, 95% CI 1.82 to 4.72) or than patients with visits to the emergency service without admission. 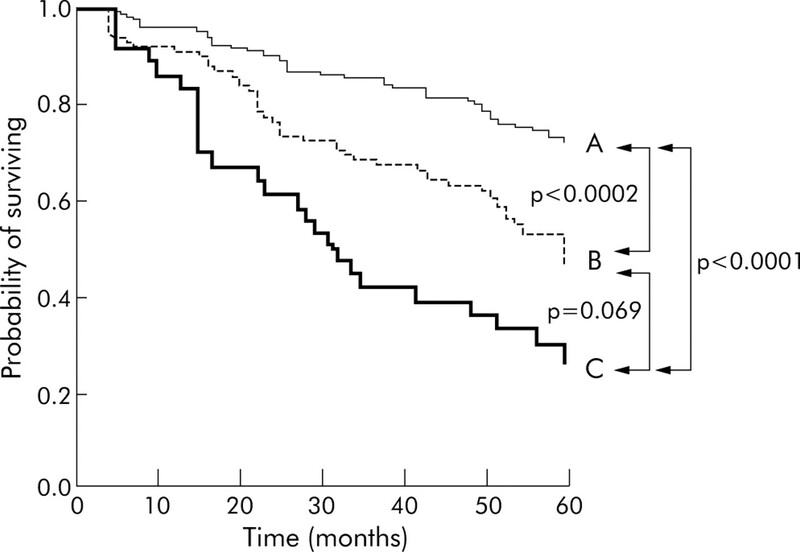 The lowest survival was observed in the group with readmissions (HR 4.31, 95% CI 2.70 to 6.88; fig 2). Kaplan-Meier survival curves by severity of exacerbations in patients with COPD: (1) no acute exacerbations of COPD; (2) patients with acute exacerbations of COPD requiring emergency service visits without admission; (3) patients with acute exacerbations of COPD requiring one hospital admission; (4) patients with readmissions. No significant interaction was observed among the different study variables and the prognostic effect of acute exacerbations of COPD. The confounding variables of this association were age, FEV1%, Pao2/Fio2, and LTOT. After adjusting the model for each of these variables, the presence of acute exacerbations of COPD continued to appear as an independent prognostic variable in all cases (table 3). Age, co-morbidity index, BMI, FEV1 (%), FVC (%), Pao2/Fio2, Paco2, LTOT, and the number of acute exacerbations of COPD during the year of the study were the variables included in the Cox multiple regression model. In this multivariate model, the frequency of acute exacerbations, age, and Charlson index were analysed as categorical variables. The risk proportionality test proved non-significant; hazards ratios were unchanged over time. Table 4 shows the regression model adjusted for all the significant prognostic variables. Severe acute exacerbations of COPD, particularly when multiple, were one of the most relevant independent adverse prognostic variables with an adjusted mortality risk four times greater than for patients without acute exacerbations. 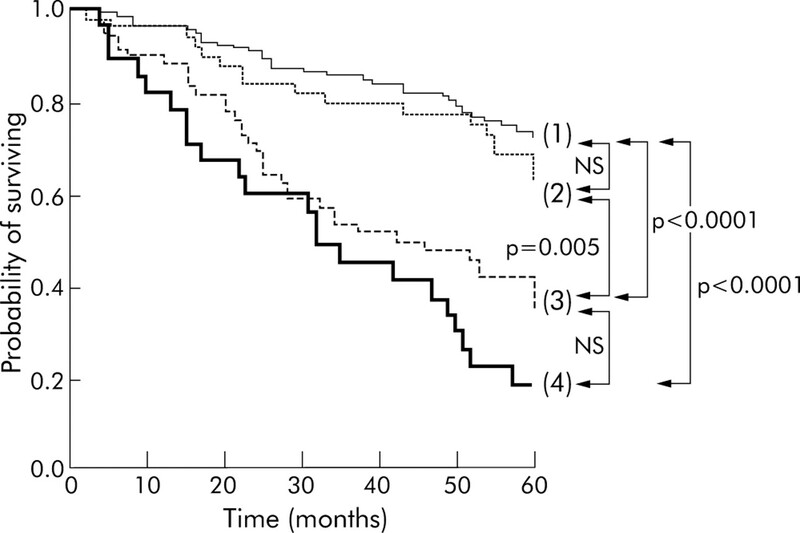 Older age and Paco2 also had a deleterious effect on survival. To our knowledge, this is the first study to show that severe exacerbations requiring hospital management are independently associated with all-cause mortality in patients with COPD. Our results suggest that the mortality risk increases with the frequency of severe acute exacerbations. The maximum mortality risk occurred in those individuals presenting with ⩾3 exacerbations, particularly if they required hospitalisation. We consider that these observations are very important since the frequency of acute exacerbations of COPD is potentially modifiable. Different studies have reported a high mortality rate after admission to hospital with acute exacerbations of COPD.17–20 In the most important series published to date, Connors et al17 recorded an in-hospital mortality rate of 11% in patients with acute hypercapnic respiratory failure. During subsequent follow up the subjects who survived the hospital admission had mortality rates of 43% and 49% after 1 and 2 years, respectively. Other series with less severe exacerbations have also reported a considerable number of deaths after admission, although to a somewhat lesser degree. Almagro et al,18 in a series of 135 patients, reported respiratory mortality figures of 22% and 35.6% after 1 and 2 years, respectively. Groenewegen et al19 likewise found a 23% mortality rate after 1 year in a series of 171 patients. The number of deaths is even higher in patients with COPD requiring mechanical ventilation. Seneff et al29 reported an in-hospital mortality rate of 24%, with mortality rates after hospital discharge increasing to 59% after 1 year. Based on these findings, it has been suggested that admission to hospital for acute exacerbations of COPD allows the identification of a subgroup of patients with a poorer prognosis.18 The most widely accepted hypothesis relates baseline severity of the disease to an increased likeliness of an exacerbation—a situation which, in turn, would explain the poorer survival recorded after hospitalisation. This hypothesis is reinforced by identification of the risk factors associated with mortality following admission, since the variables defining the baseline severity of COPD—such as advanced patient age,17,19,20 hypoxaemia,17 hypercapnia,19 BMI,17 co-morbidity,18,20 cor pulmonale,17,20 or sustained oral corticosteroid treatment19—have been described as mortality predicting factors after admission. We also observed a high mortality among patients requiring admission to hospital, with a crude mortality risk 2.94-fold greater than in subjects without acute exacerbations requiring hospital admission. However, unlike in the earlier series, our results indicate that acute exacerbations of COPD requiring hospital management per se increase the risk of death independently of other classical prognostic factors such as FEV1, age, BMI, co-morbidity or respiratory failure. Increased mortality is particularly observed in cases requiring admission to hospital and less so in patients requiring emergency visits without admission to hospital, which suggests that the severity of the exacerbation influences mortality. However, exacerbation recurrence also has an important effect on prognosis since the risk was particularly high for patients with three or more acute exacerbations and for those who had been readmitted. A recent prospective study following patients with severe COPD suggests that lung function deteriorates more rapidly in those with more frequent exacerbations.30 This effect appears to be small, however, with a mean decline in FEV1 of 8 ml/year in individuals experiencing exacerbations more often than the median compared with those who had exacerbations less often than the median. Although not specifically designed to evaluate exacerbations, the Lung Health Study noted a similar effect of exacerbations on the rate of decline of FEV1 in smokers but no effect in ex-smokers.31 Both studies suggest that exacerbations accelerate the loss of lung function, this being an indirect indicator of mortality. However, to our knowledge, this is the first study to identify an intrinsic deleterious effect of acute exacerbations on patient survival. One of the most attractive aetiological hypotheses relates inflammation (pulmonary or systemic) triggered during an acute exacerbation to patient survival. Donaldson et al32 have recently shown that the severity of exacerbations increases over time, as does sputum purulence, which suggests more inflammation in patients with more severe exacerbations. In our study we only analysed acute exacerbations which were sufficiently serious to require hospital treatment. Therefore, in accordance with the results of Donaldson el al,32 it is possible that our study patients may have had greater inflammation. A group of British investigators has also shown a relationship between airway inflammation and the frequency of exacerbations in patients with COPD.33,34 According to these authors, patients with frequent exacerbations have an increased bacterial load in their airways in the stable state. This lower airway bacterial load is associated with increased airway inflammation and an accelerated decrease in FEV1, an indirect but potent mortality indicator. Poorer survival among patients with frequent acute COPD exacerbations is currently the subject of debate. In a Dutch series19 the authors recorded no differences in survival rates between those who had been readmitted and those who had not been readmitted to hospital. In contrast, Connors et al,17 in a univariate analysis, observed an increase in mortality associated with readmission. Mortality after 6 months among patients readmitted one, two or more times was 27%, 31% and 36%, respectively, while those requiring no readmission had a mortality rate of 21% (p = 0.004). More recently, a Spanish multivariate study18 reported a 1.85-fold greater mortality rate among readmitted subjects after adjusting for other predictive variables. We also found that patients with multiple acute exacerbations admitted to hospital or seen in the emergency service had a markedly greater mortality risk and, after adjusting for different prognostic factors, mortality in these patients was 4.1-fold greater than in those with no acute COPD exacerbations. These results could support the inflammatory hypothesis whereby, as the frequency of severe acute exacerbations increases, inflammation and mortality also increase. However, we did not assess pulmonary or systemic inflammation so further studies in this direction are needed. To date, the only treatments that have been shown to improve survival in COPD patients have been smoking cessation35 and oxygen therapy in subjects with respiratory failure.5 If our results are confirmed, treatments capable of reducing the frequency of acute exacerbations of COPD could potentially reduce mortality inherent to exacerbations. Some drugs such as inhaled steroids,36 inhaled long acting β2 agonists,37 and tiotropium bromide38 have resulted in a significant reduction in the number of exacerbations. This reduction is associated with a marked improvement in HRQoL,36–38 and confirmation of our results might suggest that this treatment could also contribute to a reduction in mortality. In a recent pharmacoepidemiological study Soriano et al39 found that patients treated with a combination of fluticasone and salmeterol had better survival than those receiving monotherapy. An important multicentre study is currently underway to assess the impact of this combined treatment on patient survival.40 If our results are confirmed, other management strategies such as measures to combat the high therapeutic failure rate or early treatment could also afford benefit in terms of survival. Our study has some limitations. Firstly, the prognostic influence of acute exacerbations of COPD requiring hospital management was analysed and it is not clear whether other less severe exacerbation episodes could also exert a prognostic influence. Secondly, although we have attempted to incorporate the prognostic variables most commonly cited in the literature, some parameters that have not been examined (such as the degree of dyspnoea, HRQoL, exercise tolerance, or pulmonary artery pressure) could also interact with exacerbations and their prognostic repercussions. Nevertheless, in an earlier study41 in which we considered some of these variables, hospital admission as an expression of severe acute exacerbations was likewise shown to be an independent predictive variable. Another limitation of our study is the cross sectional data collection. Although most studies adopt this same design, longitudinal data (changes in treatment, impairment of lung function, loss of muscle mass, etc), which could equally condition mortality and interact with future exacerbations, were not available. Lastly, we lack detailed data on the acute exacerbations such as clinical aetiology and treatment, so no in-depth evaluation can be made of the causes underlying their future course. The aim of our study was to draw attention to the prognostic role of acute exacerbations of COPD per se, rather than to define the aetiopathogenic mechanisms associated with the increased mortality rate of such exacerbations. Further studies are needed which are designed specifically to address this matter. In conclusion, our results suggest for the first time that severe acute exacerbations of COPD have an independent negative prognostic impact, with mortality increasing with the frequency of severe exacerbations, particularly if these require admission to hospital. If these results are confirmed, a reduction in the number and severity of exacerbations could be regarded as priority objectives in the management of COPD. World Health Organization. World Health Report. Geneva: World Health Organization, 2000. Murray CJL, Lopez AD. Mortality by cause for eight regions of the world: Global Burden of Disease Study. Lancet1997;349:1269–76. Burrows B , Earle RH. Prediction of survival in patients with chronic airway obstruction. Am Rev Respir Dis1969;99:865–71. Anthonisen NR, Wright EC, Hodgkin JE. Prognosis in chronic obstructive pulmonary disease. Am Rev Respir Dis1986;133:14–20. Nocturnal Oxygen Therapy Trial Group. Continuous or nocturnal oxygen therapy in hypoxemic chronic obstructive pulmonary disease: a clinical trial. Ann Intern Med1980;93:391–8. Incalzi RA, Fuso L, De Rosa M, et al. Co-morbidity contributes to predict mortality of patients with chronic obstructive pulmonary disease. Eur Respir J1997;10:2794–800. Oswald-Mammosser M , Weitzenblum E, Quoix E, et al. Prognostic factors in COPD patients receiving long-term oxygen therapy. Importance of pulmonary artery pressure. Chest1995;107:1193–8. Landbo C , Prescott E, Lange P, et al. Prognostic value of nutritional sattus in chronic obstructive pulmonary disease. Am J Respir Crit Care Med1999;160:1856–61. Nishimura K , Izumi T, Tsukino M, et al. Dyspnea is a better predictor of 5-year survival than airway obstruction in patients with COPD. Chest2002;121:1434–40. Domingo-Salvany A , Lamarca R, Ferrer M, et al. Health-related quality of life and mortality in male patients with chronic obstructive pulmonary disease. Am J Respir Crit Care Med2002;166:680–5. Oga T , Nishimura K, Tsukino M, et al. Analysis of the factors related to mortality in chronic obstructive pulmonary disease. Role of exercise capacity and health status. Am J Respir Crit Care Med2003;167:544–9. Celli BR, Cote CG, Marín JM, et al. The body-mass index, airflow obstruction, dyspnea, and exercise capacity index in chronic obstructive pulmonary disease. N Engl J Med2004;350:1005–12. Miratvilles M , Mayordomo C, Artés M, et al. Treatment of chronic obstructive pulmonary disease and its exacerbations in general practice. Respir Med1999;93:173–9. Seemungal TAR, Donaldson GC, Paul EA, et al. Effect of exacerbation on quality of life in patients with chronic obstructive pulmonary disease. Am J Respir Crit Care Med1998;157:1418–22. Soler JJ, Sánchez L, Latorre M, et al. Impacto asistencial hospitalario de la EPOC. Peso específico del paciente con EPOC de alto consumo sanitario. Arch Bronconeumol2001;37:375–81. Hilleman DE, Dewan N, Malesker M, et al. Pharmacoeconomic evaluation of COPD. Chest2000;118:1278–85. Connors AF, Dawson NV, Thomas C, et al. Outcomes following acute exacerbation of severe chronic obstructive lung disease. Am J Respir Crit Care Med1996;154:959–67. Almagro P , Calbo E, Ochoa de Echagüen A, et al. Mortality after hospitalization for COPD. Chest2002;121:1441–8. Groenewegen KH, Schols AMWJ, Wouters E. Mortality and mortality-related factors after hospitalization for acute exacerbation of COPD. Chest2003;124:459–67. Fuso L , Incalzi RA, Pistelli R, et al. Predicting mortality of patients hospitalized for acutely exacerbated chronic obstructive pulmonary disease. Am J Med1995;98:272–7. Global Initiative for Chronic Obstructive Lung Disease. Global strategy for the diagnosis, management and prevention of chronic obstructive pulmonary disease. NIH Publication No 2701. NHLBI/WHO Workshop Report. Bethesda, MD: National Heart, Lung and Blood Institute, 2001:1–100. Fabbri LM, Hurd SS, for the GOLD Scientific Committee. Global strategy for the diagnosis, management and prevention of COPD: 2003 update. Eur Respir J2003;22:1–2. Charlson ME, Pompei P, Ales KL, et al. A new method of classifying prognostic comorbidity in longitudinal studies: development and validation. J Chronic Dis1987;40:373–83. Sanchis J , Casan P, Castillo J, et al. Normativa para la práctica de la espirometría forzada. Arch Bronconeumol1989;25:132–42. Roca J , Sanchis J, Agustí-Vidal A, et al. Spirometric reference values for a Mediterranean population. Bull Eur Physiopathol Respir1986;22:217–24. Rodríguez-Roisin R . Toward a consensus definition for COPD exacerbation. Chest2000;117:398–401s. Cox DR. Regression models and life tables. J R Stat Soc1972;B34:187–220. Kaplan EL, Meier P. Nonparametric estimation from incomplete observation. J Am Stat Assoc1969;53:457–81. Seneff MG, Wagner DP, Wagner RP, et al. Hospital and 1-year survival of patients admitted to intensive care units with acute exacerbation of chronic obstructive pulmonary disease. JAMA1995;274:1852–7. Donaldson GC, Seemungal TAR, Bhowmik A, et al. Relationship between exacerbation frequency and lung function decline in chronic obstructive pulmonary disease. Thorax2002;57:847–52. Kanner RE, Anthonisen NR, Connett JE. Lower respiratory illnesses promote FEV(1) decline in current smokers but not exsmokers with mild chronic obstructive pulmonary disease. Am J Respir Crit Care Med2001;164:358–64. Donaldson GC, Seemungal TAR, Patel IS, et al. Longitudinal changes in the nature, severity and frequency of COPD exacerbations. Eur Respir J2003;22:931–6. Patel IS, Seemungal TAR, Wiks M, et al. Relationship between bacterial colonisation and the frequency, character, and severity of COPD exacerbations. Thorax2002;57:759–64. Wilkinson TA, Patel IS, Wiks M, et al. Airway bacterial load and FEV1 decline in patients with chronic obstructive pulmonary disease. Am J Respir Crit Care Med2003;167:1090–5. Scanlon PD, Connett JE, Waller LA, et al. Smoking cessation and lung function in mild-to-moderate chronic obstructive pulmonary disease: the Lung Health Study. Am J Respir Crit Care Med2000;161:381–90. Burge PS, Calverley PMA, Jones PW, et al. on behalf of the ISOLDE study investigators: randomised, double blind, placebo controlled study of fluticasone propionate in patients with moderate to severe chronic obstructive pulmonary disease; the ISOLDE trial. BMJ2000;320:1297–303. Calverley P , Pauwels R, Vestbo J, et al. Combined salmeterol and fluticasone in the treatment of chronic obstructive pulmonary disease: a randomised controlled trial. Lancet2003;361:449–56. Brusasco V , Hodder R, Miravitlles M, et al. Health outcomes following treatment for six months with once daily tiotropium compared with twice daily salmeterol in patients with COPD. Thorax2003;58:399–404. Soriano JB, Vestbo J, Pride NB, et al. Survival in COPD patients after regular use of fluticasone propionate and salmeterol in general practice. Eur Respir J2002;20:819–25. Vestbo J , and the TORCH Study Group. The TORCH (Towards a Revolution in COPD Health) survival study protocol. Eur Respir J2004;24:206–10. Soler JJ, Sánchez L, Martínez MA, et al. Mid-arm muscle area is a better predictor of mortality than body mass index in chronic obstructive pulmonary disease. Chest2005; (in press).